You can buy the Revo SuperConnect from Amazon at around £250. Having picked up more than just a few awards during the last year, Revo are bang up-to-date again with another beautifully-designed music system, offering a host of features including internet radio and Bluetooth streaming. 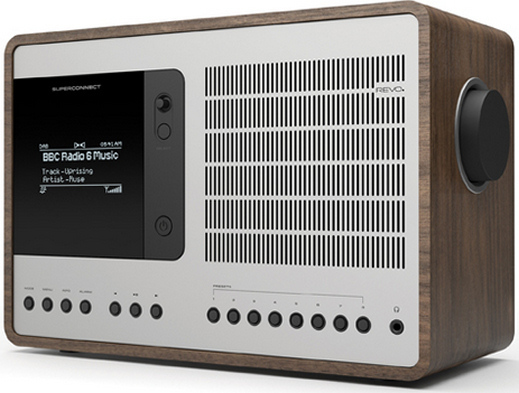 The SuperConnect's real wood cabinet oozes quality and skillfully wraps an aluminium fascia, where you'll find a plethora of features, such as Bluetooth aptX streaming (for the best audio streaming from your aptX-equipped smartphone) and 8 direct-access preset memory keys, to get you listening more quickly. Despite the absence of a dock, all makes of smartphone are welcome, here, including Bluetooth-toting Android, Blackberry, Apple devices and WindowsPhones. You can also do quick hook-ups via the 3.5mm audio input. DAB radio stations (including the DAB+ standard, which several countries such as Australia are using), FM and internet radio stations (including "listen again" and catchup shows) can all be accessed - the SuperConnect uses the Frontier Silicon portal to search out stations' streams. A small joystick in combination with other labelled keys help you navigate various options. One added advantage of an internet radio is that you don't have to wait for DAB broadcasts to begin in your area - simply use your home broadband connection to stream your favourite stations over the internet, or look up thousands of other stations covering all genres from around the world to get dance, urban and classical stations. DLNA and WLAN technology enables wireless audio playback from PC or Mac and NAS (network-attached storage) music servers - and there's an extra bonus in being able to connect to your Spotify account. The radio handles WMA, AAC, FLAC, MP3, MP2 and Real Audio file formats, for maximum compatibility. The SuperConnect ups the audio volume, with 15 Watts through its class D amplifier and Balanced Radiator (ported) loudspeaker technology, providing enough power to fill medium sized rooms. A remote control and alarm clock with sleep and snooze functions make the SuperConnect handy for use in either the kitchen, living room or bedroom. In addition, a headphone socket, hi-fi quality line-level RCA phono and 3.5mm audio inputs are all accessed 'round the back. Measuring in at 270mm (W) x 180mm (H) x 120mm (D), the Revo SuperConnect offers a huge array of features in stunning design. The Revo SuperConnect is priced at £250. Take a look in the left-hand column above to see where you can get your hands on one.